We are brothers and sisters – we are important to our families – Happy WDSD! Isaac is 11yrs old. He is a loving and very proud big brother. 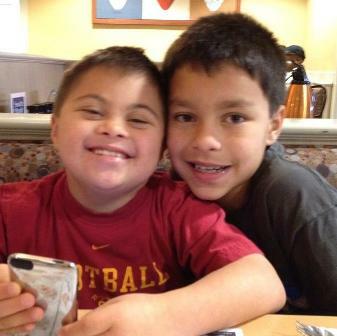 Posted in Uncategorized | Comments Off on We are brothers and sisters – we are important to our families – Happy WDSD! 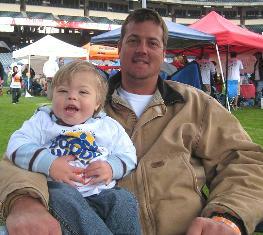 Posted in Uncategorized | Comments Off on Honoring our loved ones with Down syndrome on WDSD. Daisy has a great smile! Her family loves her, and she loves them. She has a great smile! Posted in Uncategorized | Comments Off on Daisy has a great smile! 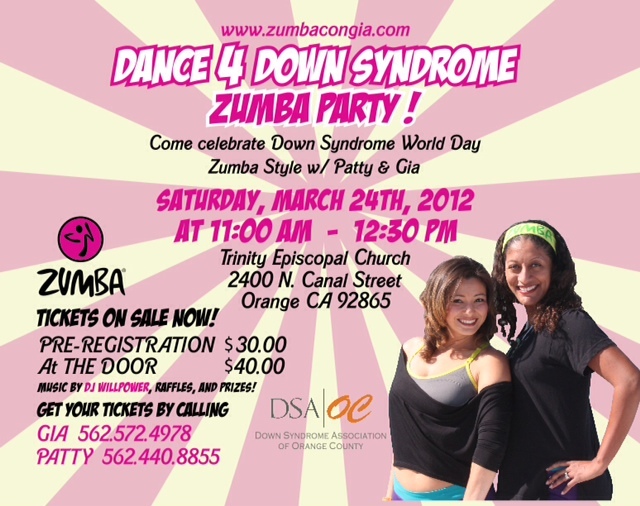 Join DSAOC at the “Dance 4 Down Syndrome – Zumba Style” World Down Syndrome Day Celebration! This Saturday, March 24 from 11 a.m. to 12:30 p.m. at Trinity Episcopal Church in Orange – $30 per ticket – includes sponsor goodies, raffle and lots of fun. Call the DSAOC Center for more information and to purchase your tickets (714) 540-5794 or you can purchase tickets the morning of the event for $40 each. See you there! 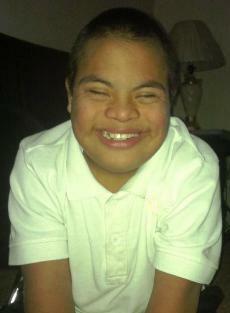 Posted in Uncategorized | Comments Off on Happy World Down Syndrome Day! When Sydney was born 29 years ago we had the good fortune of meeting, that very day, a local pediatrician, the late Victor Ince, MD. 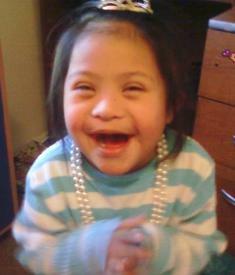 Victor rejoiced with us as parents of our brand new child, a beautiful daughter who also happened to have Down syndrome. From that moment forward it was never about what our precious daughter wouldn’t be able to do, but rather about what she might one day accomplish. We pay tribute to Victor Ince, MD as we celebrate this 2012 World Down syndrome Day. They say a picture is worth 1000 words and so I have included a few pictures of Sydney, today, and some of the memorable occasions that have happened during the past few months. Sydney is employed by Ralph’s supermarket in Mission Viejo, CA; she is a courtesy clerk and she loves her job and the people she works for and with, very much. She rounds her week out with church & community activities. She volunteers at the South County Outreach on afternoons and fullfils her calling in the LDS temple and in the ward church nursery, weekly, as well. Earlier this month she skied in the DEMO run for Park City, Utah’s National Ability Center, during the NAC Halti ski challenge, and enjoyed meeting some of the best “challenged” skiers in the country. Also in late FEB Sydney enjoyed attending the DSAOC Red Carpet Ball with a special friend, David. This event is the highlight of the year for many Orange County (and beyond) teens and adults with Down syndrome. She loves the thera-drama class she is taking at the DSAOC Center on Tuesday nights, and has the opportunity to take a nutrician & fitness class on Thursday evenings at DSAOC as well. Sydney enjoys a well rounded lifestyle in the community and beyond! AND we believe our dear friend, Victor Ince, MD would be proud!!! Tickets are on sale now at DSAOC – Don’t miss out! Celebrate World Down Syndrome Day with DSAOC & Friends this Saturday, March 24! Sponsor goodies, prizes, DJ Willpower & Zumba! This event is an awareness and FUNdraiser. Register today! Date: Saturday, March 24 Time: 11 a.m. – 12:30 p.m.
Join us for a Zumba-stic time! You must be 16 years or older to participate, and all abilities are welcome. This will be an introductory level of Zumba, so no experience is necessary. Each participant must pay a registration fee, and your fee includes 1.5 hours of Zumba fun with DJ Willpower pumping out the tunes. You will also receive a raffle entry, water and goodies from our sponsors. Posted in Uncategorized | Comments Off on Tickets are on sale now at DSAOC – Don’t miss out! Submit your photo and story to DSAOC today! Here is “the meez” Douglas! He is absolutely the best gift from the Lord above. Such a big heart, everyone wants to take and keep him! Not to mention how cute he is…. 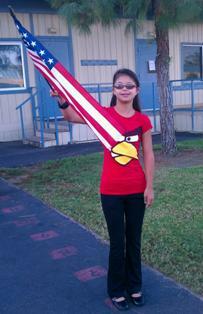 Posted in Uncategorized | Comments Off on Submit your photo and story to DSAOC today! 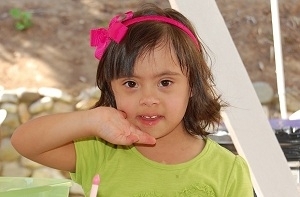 Stories from our families in honor of WDSD 3/21… Meet Krista! This is my daughter, Krista. In just a matter of 11 years, Krista has inspired and brought so much happiness to everyone she meets. When Krista was first born, my husband and I mostly heard the negative about having a child with Down syndrome. Krista hasn’t stopped showing us the positive. She has also proven time and time again that if she wants it, she makes it happen! Krista has taught us patience, faith, unconditional love, and how to appreciate the small things in life. Krista may not understand it today, but her positive spirit and her never ending self confidence, make me want to be a better person. I truly believe my husband and I were given a very special gift the day Krista was born. We can’t wait to watch all the wonderful things she will offer this world! 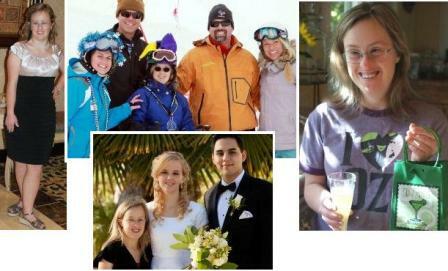 Posted in Uncategorized | Comments Off on Stories from our families in honor of WDSD 3/21… Meet Krista! From the hearts of our families, in honor of World Down Syndrome Day. We will post your child’s picture along with a couple sentences or word that best describes them. 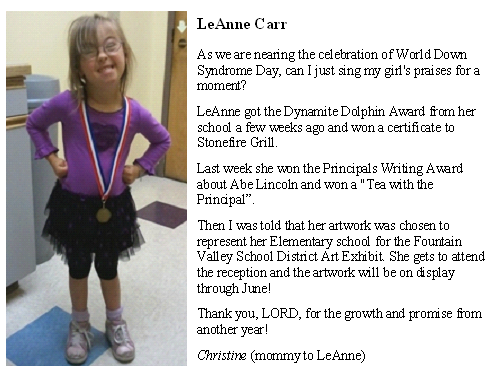 Posted in Uncategorized | Comments Off on From the hearts of our families, in honor of World Down Syndrome Day. Blair has shared pictures with DSAOC in the past, and he sure has an eye for capturing the moment! DSAOC Celebrates WDSD by highlighting our families… SUBMIT YOUR PHOTO/STORY TODAY! Don’t forget… SUBMIT your photo and brief story or word that best describes your loved one with Down syndrome, and it could appear here on our Blog and Facebook pages! Posted in Uncategorized | Comments Off on DSAOC Celebrates WDSD by highlighting our families… SUBMIT YOUR PHOTO/STORY TODAY! SUBMIT YOUR CHILD’S PHOTO along with a word or phrase that best describes them and the love they bring to your life. DSAOC will be posting photos/text to their blog/Facebook pages throughout March. SUBMIT TODAY to: info@dsaoc.org. March 21, 2012 will mark the 7th anniversary of World Down Syndrome Day, and for the first time this special day will be officially observed by the United Nations. Each year the voice of people with Down syndrome, and those who live and work with them, grows louder. Join DSAOC and other organizations as we celebrate the beauty that individuals with Down syndrome bring to our homes, communities and the world.